It was a learning experience for our young players who were part of the Vodafone Fijian football side that played Malaysia last Thursday night. Despite going down 1-0 in Kuala Lumpur, the players returned home yesterday all excited of the experience and what they had learned on tour. It was a big plus in the football career of Fijian Under-19 players of striker Kaliova Dau, midfielder Savenaca Baledrokadroka and Ba defender Kishan Sami. Dau, a Tavua representative, came off the bench in the second minute of the second half to re­place Rusiate Matererega. “It was a big break especially playing for Fiji for the first time,” he told SUNsports. Dau is the nephew of Lautoka de­fender Jone Vesikula and the for­mer Ba greats of Meli Delai, Lote Delai, and Josaia Dau. Baledrokadroka who plays for Rewa ran into the field of play in the last two minutes of the match to replace Mitieli Namuka. “I need more game time. The more we play the better we become,” he said. Sami who plays for Ba played the full 90-minutes. “It was a good game and there is more to improve as a team. This was a chance to boost our football career,” he added. 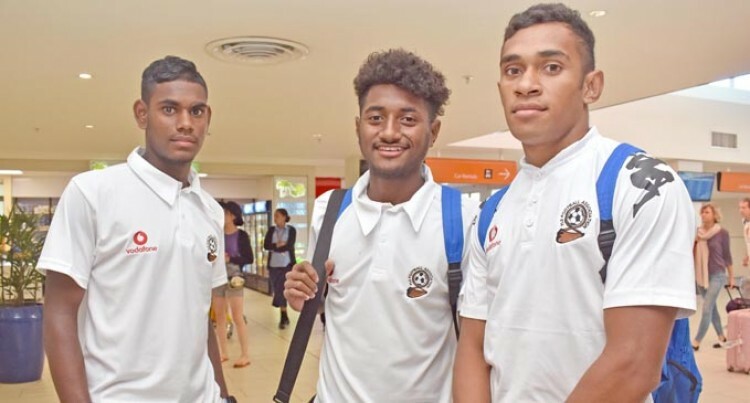 The trio joined the Fijian U19 side at the Fiji Football Academy in Ko­rovuto, Nadi to prepare for their Australia tour. The team depart our shore on July 21 and return on July 30. July 22- v VMSA All Stars, at Ser­bian Club Stadium; July 24- v Mel­bourne Victory at Epping Stadium; July 26 v Springvale White Eagles at the Serbian Club Stadium; July 29; v Club Mauritius at the Ser­bian Club Stadium.